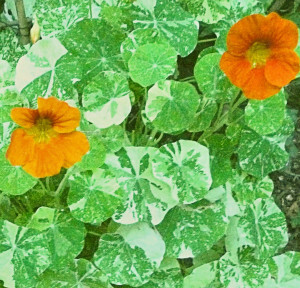 The Nasturtium comes from South America where it thrives, given sunshine & poor soil. This annual, with its disc-shaped leaves and sumptuous flowers, will add a splash of the exotic to any garden. It needs no special treatment, no fertilizer. Pests & diseases do not trouble it. 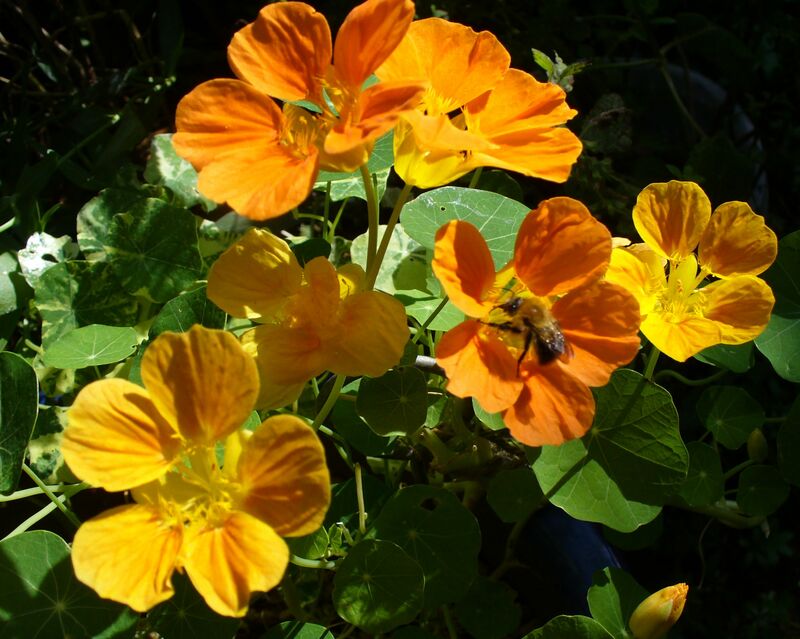 Tropaeolum’s bright YELLOW, ORANGE and RED flowers attract the bees, who land on the lower petals, climb inside the flower spur & emerge covered in pollen. Once pollinated the flower bows down, resembling Gandalf the wizard’s hat in Lord of the Rings. 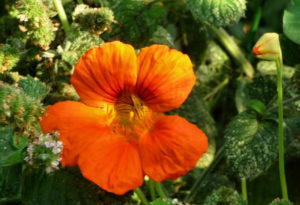 The plant will produce other blooms, & carry on doing so until first frosts. 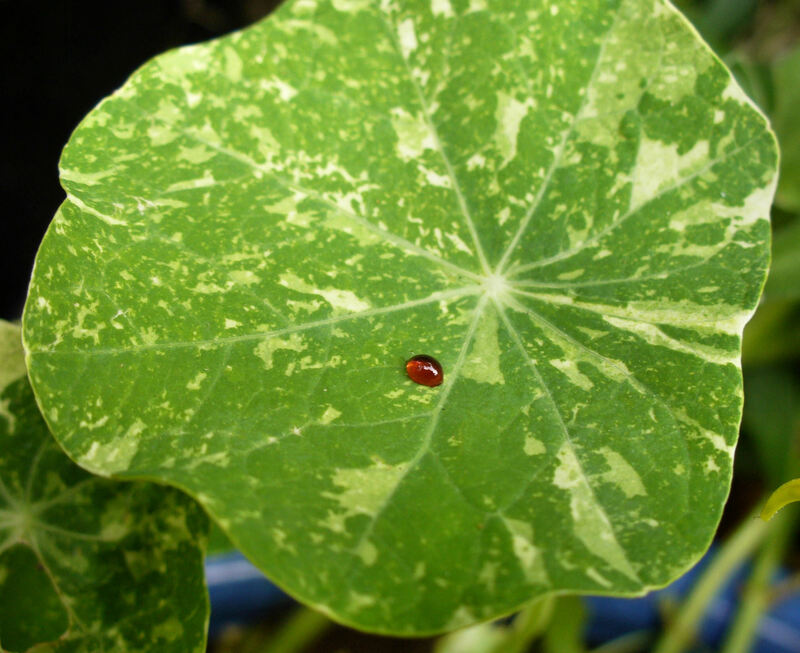 If Blackfly or Greenfly are a problem, & ladybirds or birds not keeping numbers down, spray the plant with a little dilute washing-up liquid. Aphids dislike the slick coating on the leaves. 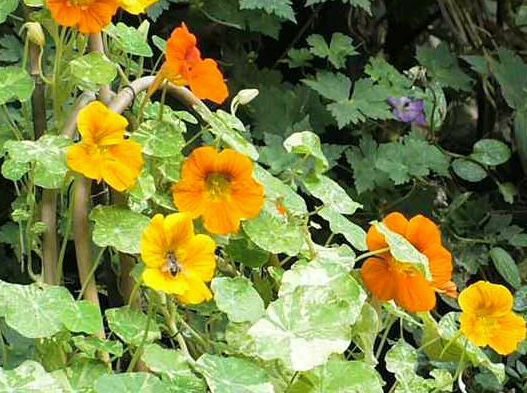 Once the individual flowers have gone over, let some go to seed but pinch most of them off to persuade the plant to make more. 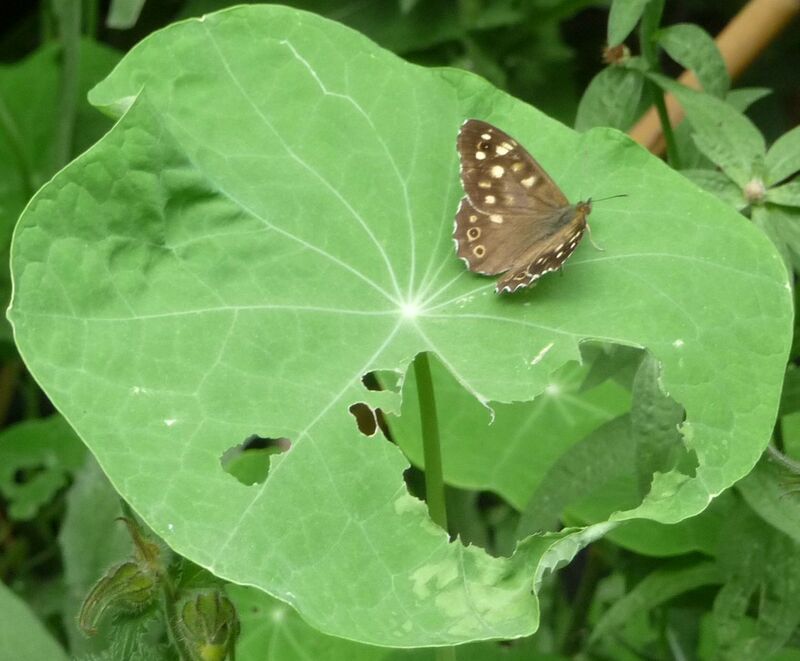 Nasturtium leaves are a food plant for the Dot Moth and the Garden Carpet Moth; they are used by gardeners to keep the caterpillars of the Large White (Cabbage White) Moth off their brassicas. 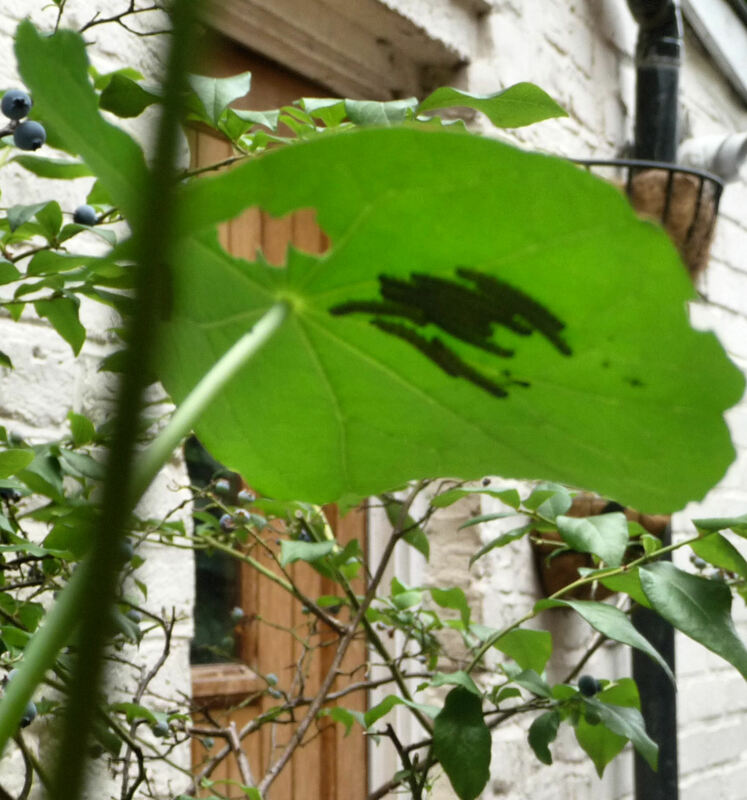 Cabbage White caterpillars under Trailing Nasturtium leaf. 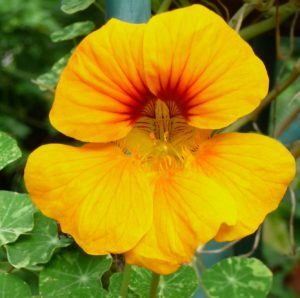 “According to the daughter of Linnaeus, the blossoms of Nasturtium have been observed to emit electric sparks towards evening. It is seen most distinctly with the eye partly closed. 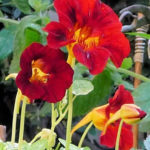 Wikipedia lists the Nasturtium under many species of Tropaeolum. Its herbal uses have been antiseptic and expectorant, with Tropaeolum majus useful against chest colds. 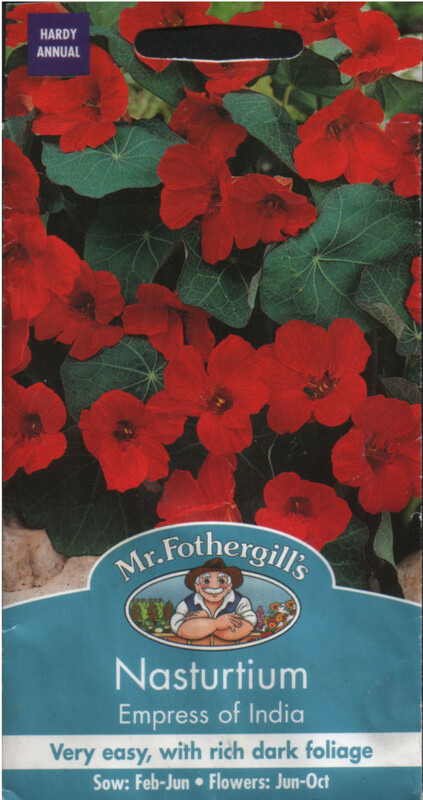 We also grow Empress of India, with its rich RED flowers and dark, bottle-green leaves. The YELLOW and ORANGE flowers of ‘Whirlybird’ have no flower funnels, but the bees don’t mind. Capuchina, Capuchin Monk, Capucine, Cresson d’Inde, Grande Capucine, Kapuzinerkresse (German), Lark-heel, Mexican Cress, Monks Cress, Peruvian Cress, Nose-tweaker, Nose-twister., The ‘nasties’. 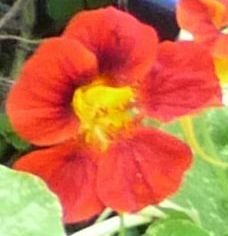 My first Nasturtium had masses of leaves but few flowers; friend Eileen said “You want poor soil! Find yourself some builders’ rubble!” This was good advice. 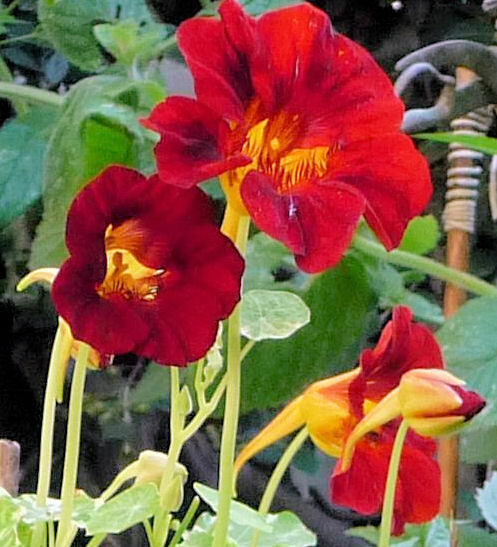 Used soil from house plants, builder’s rubble & grit – the Nasturtium found them all to its liking. It began producing blooms, and many of them. 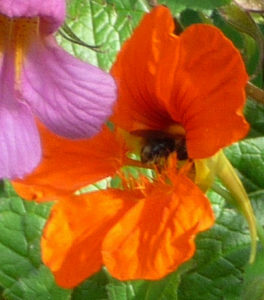 Bumblebees found these blooms, flying up to the third floor balcony to visit the Nasturtiums. They came steadily throughout the summer, buzzing from one trumpet to the next, brushing my hands with their fur as I tended the flowers. 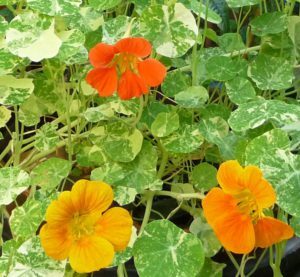 I have kept Nasturtiums through London winters by covering their pots in bubblewrap when frost was predicted, & removing it when temperatures rose. By springtime plants were barely ticking over; sunshine & watering revived them. However, if kept outdoors for too long in freezing conditions, the plants were doomed. Nasturtiums are not hardy enough to survive our winters unless kept indoors, in a greenhouse or conservatory. 2018: Our Nasturtiums have had a terrible summer. These ‘Alaska’ flowers, a gift from Eda by way of Chapel Market, bloomed before the summer desert heatwave. But there were no further flowers & leaves were tiny, the size of a halfpenny piece. 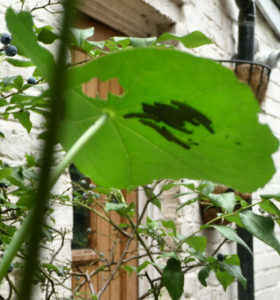 An ‘Empress of India’, too, produced tiny leaves & no flowers for the duration of the heatwave. 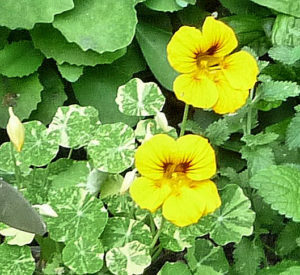 A Bush Nasturtium & a Trailing Nasturtium made normal leaves but managed no flowers. 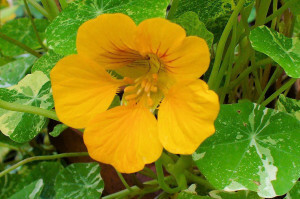 According to a few websites, including Dave’s Garden, Nasturtiums dislike extreme heat and humidity. Today, 30th August, over a week since the desert heat gave way, we have had one Empress of India flower & another bud… No blooms from the others. It is as if the extreme heat seared away the plants’ memory of how to produce buds and flowers.